Book – Non-fiction. By Keith Medley. 2012. This book documents the untold history of the organizing leading up the Plessy v. Ferguson case. In June 1892, a thirty-year-old shoemaker named Homer Plessy bought a first-class railway ticket from his native New Orleans to Covington, north of Lake Pontchartrain. The two-hour trip had hardly begun when Plessy was arrested and removed from the train. Though Homer Plessy was born a free man of color and enjoyed relative equality while growing up in Reconstruction-era New Orleans, by 1890 he could no longer ride in the same carriage with white passengers. Plessy’s act of civil disobedience was designed to test the constitutionality of the Separate Car Act, one of the many Jim Crow laws that threatened the freedoms gained by blacks after the Civil War. This largely forgotten case mandated separate-but-equal treatment and established segregation as the law of the land. It would be fifty-eight years before this ruling was reversed by Brown v. Board of Education. ISBN: 9781455617234 | Published by Pelican Publishing Company. Book – Non-fiction. By Keith Medley. 2014. 288 pages. Historian Keith Weldon Medley recounts the rich history of African and African-American cultural influence on one of America’s most-beloved cities. This in-depth account is one of personal significance for the author, who was raised in New Orleans’ Faubourg Marigny and whose family history is tied to the area. Through fifteen self-contained chapters, Medley takes a chronological and focused look at some of New Orleans’ most prominent people and places. Read more. Article. By Keith W. Medley. 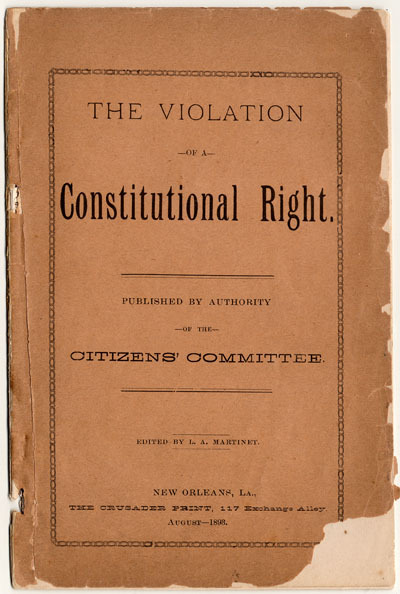 The role of the Comité des Citoyens and The Crusader newspaper in the Plessy v. Ferguson case.